Twenty-two percent of hedge fund investors tracked by Preqin’s Hedge Fund Investor Profiles database will consider investment in emerging managers, perhaps attracted by the frequently offered lower fees, niche strategies or the ability of such funds to be nimble, as well as the scope for high net returns. However, the majority of investors will not consider such funds, normally requiring a proven track record. Preqin defines an emerging manager as a manager with a track record of less than two years or less than $100mn in assets under management (AUM). 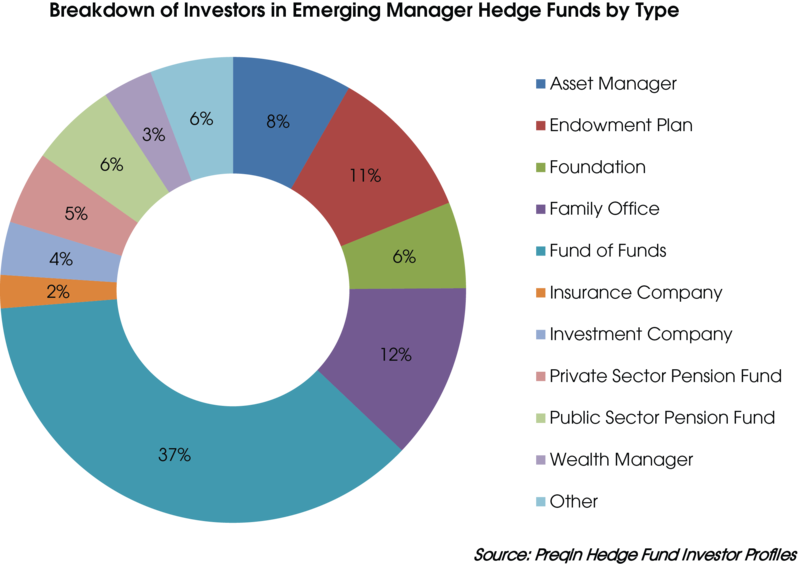 The most common investors in emerging managers are funds of hedge funds, likely due to their expertise and experience selecting managers, which comprise 37% of all investors considering emerging managers profiled on Preqin’s Hedge Fund Investor Profiles database. These are followed by family offices at 12% and endowment plans at 11%. Family offices tend to have greater return expectations and the ability to take on more risk, while endowment plans are experienced investors in the hedge fund space, making emerging managers a more viable option. The average allocation to hedge funds of investors who will consider emerging managers is approximately $1.2bn; however, being a large allocator in the space does not necessarily mean the investor will consider emerging managers. Despite having some of the highest average AUM of the investor groups, pension funds and insurance companies rank among the lowest in terms of the proportion of an investor type that considers emerging managers. This is likely due to their relative risk aversion tendencies and the fact that emerging funds may represent too small an allocation to be worthwhile for their vast portfolios. Preqin’s September Hedge Fund Spotlight outlined that large funds ($1bn or more) have more attractive risk/return profiles, which is one reason why emerging funds may need to offer more favourable fees and terms to attract investment. Furthermore, emerging funds have the lowest mean management fee, mean performance fee, mean lock-up period and mean redemption frequency of the fund size categories. Emerging managers may also offer access to a founders’ share class, with attractive low fees to encourage initial investment. As larger funds continue to see the greatest proportion of capital inflows, the high level of competition for investor capital among emerging managers is likely to remain. However, as small and emerging funds continue to offer the opportunities for the highest maximum net returns, investor interest is likely to prevail, particularly from funds of hedge funds, family offices and foundations, which have the experience, expertise and risk appetite to select such funds.